Home » Vegetable Garden » How to Grow Eggplants or Aubergines. How to Grow Eggplants or Aubergines. Growing Eggplants (varieties) or Aubergines in containers and in the garden and and mail order Eggplants or Aubergines seed. Eggplants require a warm sunny position to grow well, regular watering will promote growth and a humus rich fertile soil is best. Eggplant varieties are varied both in shape and color with Imperial Black Beauty Eggplant ( Solanum melongena ) being the most common in stores. Eggplants can be grown in containers. You will need a large 4 - 5 gallon container with room for 4-5 plants. A high quality potting soil and some slow release 'all purpose fertilizer'. Remember that large containers can be heavy when filled with soil, so place the container in it final position (remember that eggplants like to grow in full sun). Fill the container with potting soil and plant the eggplants close to the outside of the container, but not against the edge. Water in well and fertilize every 3 weeks. Eggplants should be planted after the risk of frost is over. Those Eggplants with oval fruit such as : Black Beauty, Black Magic, Dusky, Melanzana Prosperosa (pictured above right), Early Bird and others. 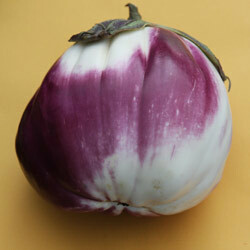 White Eggplant Varieties include: Caspar and Easter Egg, Gretel F1, Solanum ovigerum or Easter White Eggplant. Many other Eggplant varieties exist some with very attractive and colourful fruit, however beware, some eggplant species are very bitter and inedible.